New Pokemon Revealed in Latest Pokemon Sun and Moon Trailer | Nerd Much? New Pokemon revealed themselves this morning in a new trailer for Pokemon Sun and Moon. With eight new reveals, we have a lot to unpack. Among the new Pokemon revealed, we have new evolutions as well as Alola Forms of older ones. 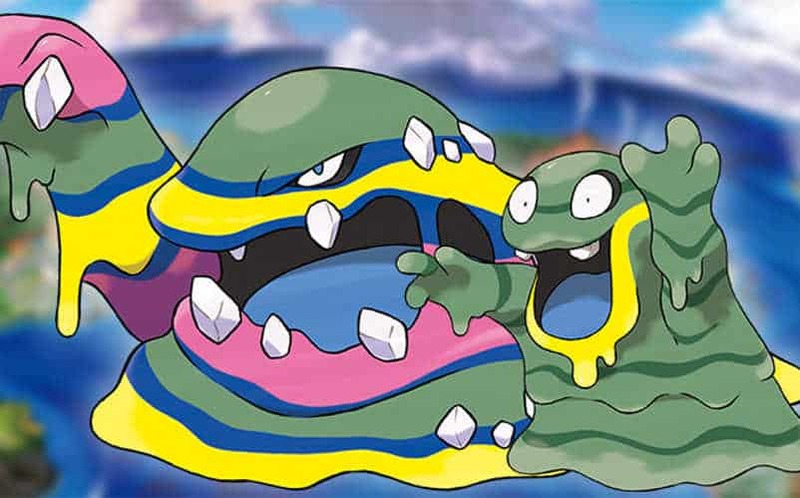 Starting off with the familiar, the Alola Forms of Grimer and Muk were revealed. Appearance wise, these Pokemon have changed from their previous purple appearance and into something more tropical. Muk has also formed a number of crystals upon its body. Next up we have two new evolutions for Bounsweet. This adorable little Pokemon evolves into Steenee and then eventually into Tsareena. They resemble a tropical fruit or flower and are grass type Pokemon. Another new evolution is for Cutiefly. As you can probabaly guess, this cutie pie of a Pokemon evolves into an adorable Ribombee. When Jangmo-o was first revealed, you could just that this little guy was going to grow up to be something fierce. That’s definitely the case in his raptor-like evolutions. First, he evolves into Hakamo-o. This guy is covered in shield-like plates to keep him protected. His final form is Kommo-o. He evolves after tons of harsh training, giving him his impressive stature. The last of the new Pokemon revealed is definitely the most interesting lore-wise. Previously, a mysterious Pokemon called Null was announced. What makes him intriguing is his incredibly heavy mask that designed to control his powers. When he fully trusts his trainer, he destroys the mask and becomes Silvally. These Pokemon get us excited to jump into Pokemon Sun and Pokemon Moon. Luckily, we only have to wait one more month for its November 18 release.